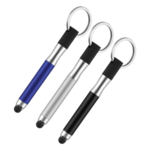 Branded stylus pens are ideal gifts to send out to clients with smart mobile phones and tablets. 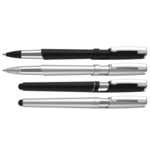 These days a branded pens with a stylus can be very useful, especially for people who spend a lot of time on mobile gadgets like these. 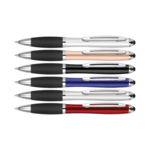 The pen itself can be branded and you could even bundle it with another promotional gadget from our mobile gifts collection. You can use a stylus with a touch screen device which can include a smart mobile phone, tablet computer or laptop with touch screen technology. 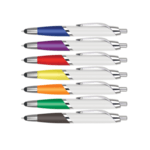 The stylus ballpens we supply have rubber end. 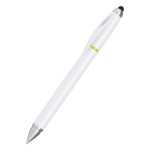 Placing the rubber stylus end of the pen against the screen allows the user to select a function or write or draw as though they were doing so on a piece of paper. The touch screen takes the stylus touch as input and stores this as a drawing, program or feature selection, text or handwriting. 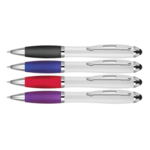 Stylus ballpens are very popular and growing in their everyday usage. Early technology organisers used a stylus as a pointer. 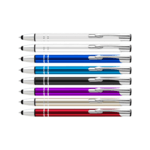 The modern stylus pen has taken this to a new level along with the invention of intelligent touch screens. The type of screen used on a smart phone is a capacitive type. The type of screen used on earlier devices such as hand-held organisers would have been a resistive touch screen. This consisted of two conductive layers which would have been sandwiched into a screen. When a stylus was placed on to the screen, the two layers would have been pressed together to form an electrical circuit. A downside of this type of touch screen was that a large amount of pressure would be needed. The stylus helped to apply this force and other similar plastic devices could be used. Capacitive touch screens are more intelligent and look for electrical field variations instead of a physical force being applied. 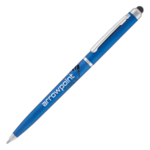 Most smart touch screens can be activated using a finger or pen stylus type equivalent. Pressing a finger or stylus against the screen changes the electrical field and capacitive nature of the screen which is itself made from a conductive material. Steve Jobs of Apple always wanted devices to be used a stylus and all touch screen products developed and launched during his tenure did not require a stylus but could be used with one if required. 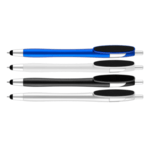 Whilst most Apple products continue this design philosophy a few such as the iPad do now come with a stylus pen option. The Microsoft Surface tablet is another device that comes with a stylus as standard but not as a combination pen you can write with. So what’s the difference with a ballpen? 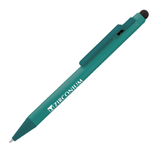 Well a promotional pen with a stylus is actually a combination product, combining a standard ballpen with a rubber stylus end. This gives two obvious advantages. 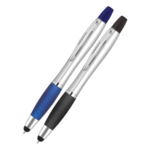 The first is that the client receives a working pen and the second a functional stylus. In this day and age having both makes perfect sense for people who rely on their smart phones and tablets and have to make notes. Writing products like this also have some advantages. Drawing with a stylus on a smart screen can feel more natural than with a finger tip and be more accurate as the pen stylus mimics what could be a traditional pencil or paint brush. Selecting keys and functions on a smart screen can also be more accurate. 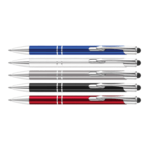 When you look at our pens you will see that the main options are in the barrel types and their shapes and colours. Some of the pens have plastic and some metallic feel to them and there are different shapes including thin and wider feel barrels. 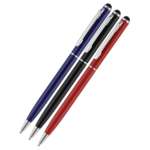 We also supply what we call novelty pens or novelty pens. These are somewhat quirky in their design and night have a key chain, key loop attached or a plastic character. When it comes to branding what you have to consider is the imprint area. If you look at each pen this will show the imprint size available on the barrel which is normally the most used area of the pen to print on .The shape of the available area will almost always be rectangular and will therefore accommodate easily a rectangular shaped logo and contact details. If you logo is squarer you may need to consider adjusting the shape to make the logo stand out. Another aspect to remember about the imprint area is the font size and its readability. If you choose too small a font a website address or phone number the text may be illegible to people who are short-sighted whether they wear glasses or not. Also the smaller the font size, the greater the chance of ink ink-fill into the non-printed areas inside a letter. Classic examples are O, P, D etc. If we spot this as a potential print problem we will advise this on the artwork approval form we send over to you. 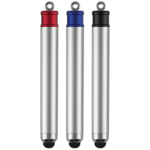 Finally consider choosing a bold colour for your pen barrel or your artwork and then contrast accordingly to make sure you imprint and logo stands out. 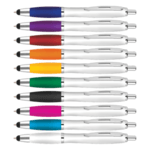 If you are interested in using promotional pens as part of your marketing, please do have a look at the products we have. 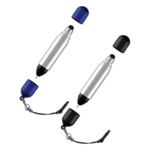 There are some novelty pens including ones that light up a barrel placed logo to add another interesting feature as well as the stylus end. If you need samples let us know and we can send you examples of ones supplied for other marketing campaigns. 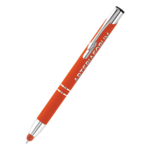 Can you use digital printing on a stylus pen? 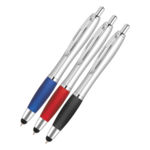 Digital is fast taking over from a four colour print process and is available for stylus pens. Digital printing also tends to be less costly than a full colour traditional print process and offers as good as colour print. 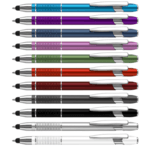 How long do stylus pens last? 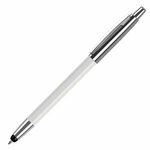 This depends on how hard and often the pen stylus is used. 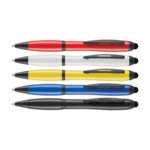 With care the pen stylus can last a long time. It is foam or runner shaped end over a metal attachment. If mistreated and pushed down too hard, the metal end can start to cut into the stylus end. 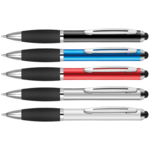 How do stylus pens work? 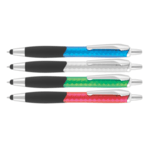 Stylus pens are designed for use with a touchscreen on a mobile or table or laptop computer. These types of screen have a capacitive electrical characteristic and the rubber or foam stylus end is conductive. As the stylus touches or is moved across a touchscreen the movement can be tracked and interpreted by the electronic device.